As much as I love all sorts of fantasy books and video games and sci-fi shows and what have you, there is a part of me that, at the end of the day, is little more than a fifteen year old girl. This part of me likes reading young adult romance novels, is a huge fan of Meg Cabot (writer of The Princess Diaries), and so on. That part of me was drawn to Gilmore Girls back in the day, when my wife and I effectively blew through seven seasons of the show in about two months time. I became an unabashed fan of Amy Sherman-Palladino, even through that really misguided The Return of Jezebel James with Parker Posey, so I was very ready to get on board with a new show. One other thing about my past I forgot to mention? I took tap dancing lessons for ten years as a child. This isn't shtick - I tried 'em all, but tap stuck with me and I tap danced from ages four to fourteen. That part of you really never goes away, so when I read that Amy Sherman-Palladino was offering a) a new show b) similar to Gilmore Girls c) that involved dancing? Yeah, I'm in. So first, if you're unfamiliar with Gilmore Girls, get familiar - it's a great show with a really wild cast of characters and some rock-solid writing. Yes, the lead girl, Rory, has dialogue way above what her age should be. Yes, everyone talks too quickly. No, nothing about it is especially realistic, but that's not the point, is it? It's a fun, bizarro dramedy that is unlike anything I've seen on television before or since. There's a certain voice to the show, both in terms of the writing and the setting, that is extremely unique and could probably be sniffed out from anywhere - very similar to the Joss Whedon effect in a lot of ways. Plus, James Gunn's brother is a regular on the show, and who wouldn't want that? The Return of Jezebel James, even though it combined two of my favorite things (children's books and Parker Posey) was just a miss on a number of levels. A traditional sitcom from a writer who's anything but traditional, with a cast that probably shouldn't be doing traditional sitcoms? It just didn't work well, and I really thought that might be the last I heard from Sherman-Palladino on television. I don't know what it was that clued me in that Bunheads was a thing, but when I heard that it was Sherman-Palladino was involved, I had to at least give it a shot. The show's lead is Sutton Foster (pictured above), who has significant Broadway experience, and hearing that the grandmother from Gilmore Girls was involved as well as Hollywood everyman Alan Ruck, I was pretty much in for a good long look. Early on, we meet the four main girls in the dance studio as well, and they're also equal parts strange and hilarious. The cast in general is really a good part, raised even higher by a lot of fun writing. 1) Sutton Foster? She may as well be Lorelei Gilmore. The mannerisms are similar, the writing is similar, the character itself is Lorelei with ballet slippers. The four girls? They may as well be individual versons of Rory Gilmore's personalities, or those she was dealing with over her time in Stars Hollow or at Yale. There's one who's really insecure, another who's very different and doesn't quite fit in, there's the pretty and standard one, and then the more catty girl. They're pretty baseline television tropes, but between everyone in the cast, they work off each other very well, and we're already starting to see a lot of really good characterization now that the show is a hit and it's gotten picked up for more episodes. 2) The small town of Paradise, California is both the west coast version of Stars Hollow, Connecticut, and is as absurdly unrealistic as Stars Hollow was. It's really a wonderful thing, I promise - part of the unspoken conceit of the show is how this small town can handle everything that's going on, from the random millionaire on the hill to the always-hopping Oyster Bar to the fact that the dance studio apparently has multiple competent male dancers available to it. Being from New England, I could see a lot of Stars Hollow in the small town I used to work in, but Paradise just seems off-the-wall absurd. I love it. 3) The first episode takes one of the biggest chances I have ever seen a show take, period. The way the first episode goes is something I've rarely seen, especially in what's designed to be a mainstream comedic family program. I don't even want to give the twist away, because it's so well-crafted and bought a lot of good will in the Raymond household. Combine all these things up, and I think you have a winning combination. While it's not quite appointment television, it definitely doesn't sit very long on my DVR. The show is getting plenty of love, but I think it needs more. 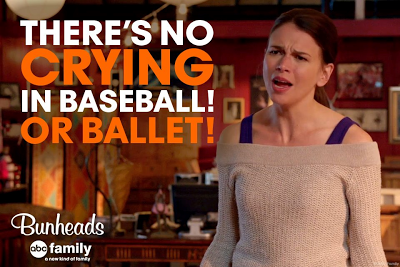 If you're interested in a well-written bag of candy to offset your gritty realistic fare, dance on over to Bunheads. I think you might like it. I keep seeing this crop up and had no idea what it was about! Sounds like it's right up my alley though, will totally check it out.